WASHINGTON -- The United States will seek North Korea's commitment to the security of American personnel in future joint operations to recover the remains of US soldiers killed in the 1950-53 Korean War, a senior Pentagon official said Tuesday. 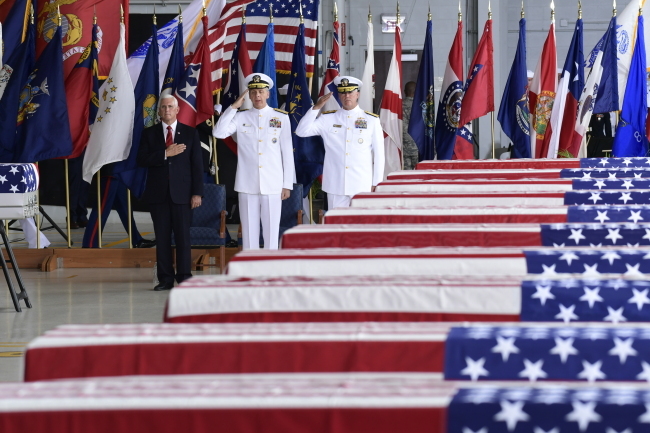 Last month North Korea returned 55 boxes of the remains of presumed American troops following an agreement between North Korean leader Kim Jong-un and US President Donald Trump at their historic summit in June. The leaders also agreed to resume operations that were halted in 2005 to recover the estimated 5,300 American troops missing in North Korea since the war. Details of when and how the operations will resume have yet to be finalized. "Security is primarily our responsibility for our personnel," Kelly McKeague, director of the Defense POW/MIA Accounting Agency, told reporters at the top of a regular White House press briefing. "We also pay attention to communications, having communications abilities, as well as having an ability to medevac our personnel, should they get hurt," he said. North Korea and the US conducted 33 joint field activities from 1996-2005 before then-US President George W. Bush suspended them amid tensions over the regime's nuclear weapons and ballistic missile programs. "What we would be looking for from the North Koreans is, again, a commitment from them that communications, medical evacuation requirements can be met," McKeague said. "And more importantly, that we can conduct these joint operations in a collaborative way, as we had done for 10 years. It all comes down, back into 2005, to their behavior on the international stage." The director also acknowledged that a decision on joint recovery efforts could be made in tandem with the broader negotiations to dismantle North Korea's nuclear weapons program. "But for now, we're treating it as a military-to-military contact," he said. "But, more importantly, as a humanitarian endeavor that's separate and distinct from anything else." US Secretary of State Mike Pompeo secured a commitment from the North Koreans during his last trip to Pyongyang to begin talks to resume the joint operations. Those negotiations have not begun yet, McKeague noted. John Byrd, the DPAA Laboratory director, recalled his past experience of working with the North Koreans from 1996-2005 and said the atmosphere was different when he went to the North to collect the 55 boxes last month. "It was a much more friendly, welcoming and collegial approach this time compared to the way it used to be," he said, speaking alongside the director. The boxes of remains are now being identified at the DPAA lab in Hawaii, a process that could take months or even years.